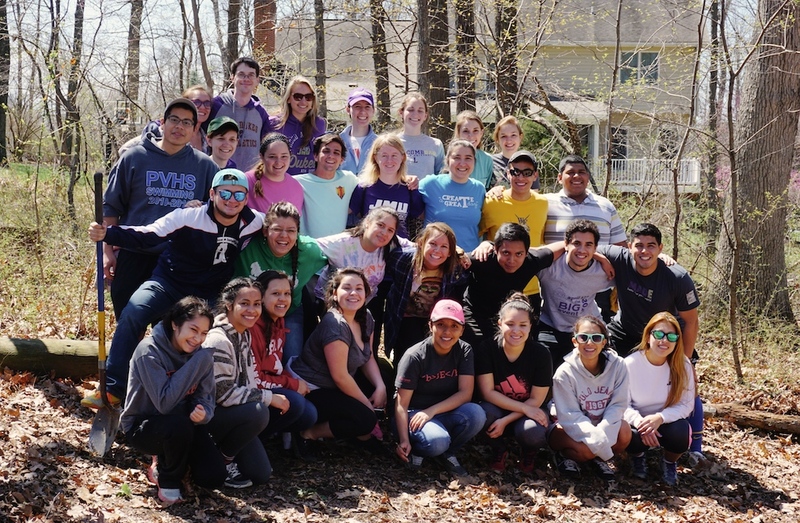 For the third consecutive year, SV-SLI high school scholars and mentors cleaned up a trailed nature area at Thomas Harrison Middle School as a service project for JMU’s Big Event. The day was spent clearing brush, and planting trees and shrubs donated by Rodamer’s Landscaping of Harrisonburg. With help from a team of JMU’s Dingledine Scholars (D-Unit! ), the clean up project only took about 3 hours. I had the pleasure of working alongside some of the SVSLI members during the clean up. This was fun because while we were working, they played music and made jokes which made me forget I was even doing manual labor. It was easy to see how much they enjoy spending time with one another. When I first got to the trail, I felt a little awkward because I didn’t know anyone. I tend to be pretty shy at first, but the SVSLI students quickly took me under their wings and my anxious feelings dissipated. I spent most of my time working with Kelly, Maria, and Rocio. They made me feel like I belonged there with them and that we had been friends for years. While working, we got to know a little bit about each other, too. Just from this short amount of time working and talking, I could tell how much the SVSLI program has impacted all of their lives and will continue to positively impact them in the future. I really enjoyed spending time with this wonderful group of people and am now better able to understand how important this program is for the students and the community. *The Big Event is an annual event that organizes JMU students for various community service projects. This entry was posted in community, Education, mentor and tagged Attitude, cleanup, communication, community, future, Harrisonburg, JMU, latino, mentor, middle school, nature, SLI, The Big Event, trail. Bookmark the permalink.